Catholic Cursive Writing Worksheets for teaching the Baltimore Catechism, spelling, and handwriting. 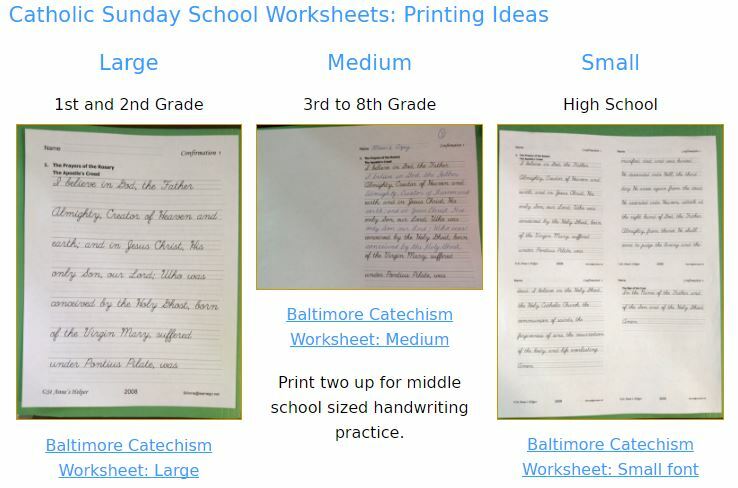 Printable Cursive Writing Worksheets with Baltimore Catechism text. You'll love our cursive writing worksheets. Cursive writing is such a beautiful art! Not only is it beautiful, these Catholic worksheets help you teach the Catholic Faith. You'll find that cursive can also help with reading. How? Well, I have seen children who simply could not get the idea of words and their separations in sentences until the moment they started writing words in cursive hand. They saw the letters that linked together to form words and they saw the spaces better when they were writing in cursive. Many schools today do not teach cursive - that's why it is highly sought by parents - on the Internet. The numbers showed that there was a need, so we have writing worksheets in both manuscript and cursive. 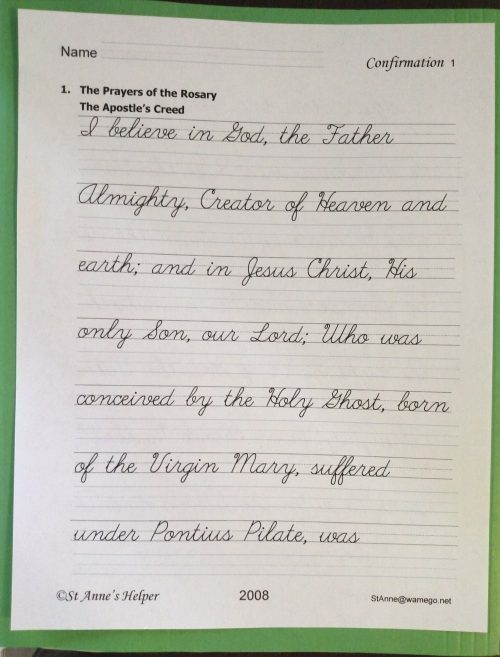 Catholic cursive writing worksheets? It is a proven fact that the more ways a student sees, hears and writes his studies, the better he learns them. 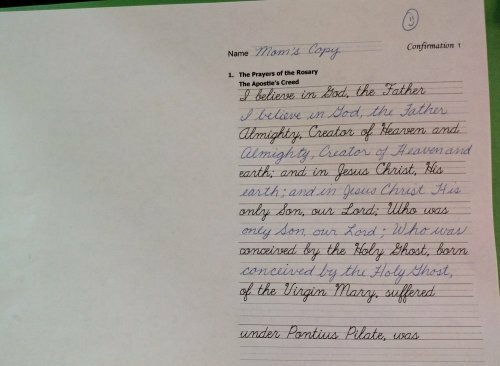 If your students must practice handwriting, why not practice on Catholic material? Which better than the answers to the Baltimore Catechism? 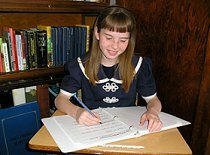 Our St. Anne's Helper First Communion and Confirmation copybooks are each done in manuscript and cursive. Anyone can use these to improve his handwriting and his knowledge of the Catholic Faith. Our older children as well as our younger children appreciate these. One of the basics to learning fancy writing or cursive writing is to acquire the habit of using the top line, mid-point, and base line. Sometimes it can take quite a lot of practice. Now you can print at will. Once your student knows the catechism answers, the handwriting practice is easy and can even help form good spelling and reading skills. These downloads are interactive. 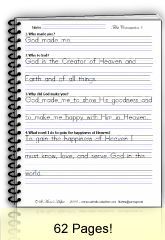 You can copy the files to your children's file and they can choose their font, size, and color to have typing practice as well as catechism class. Great for older children and can save ink, paper, and heartache. Make First Communion or Confirmation day a great day spiritually by providing a coloring page or a card with a chart on it (for older students) to keep track of prayers and sacrifices. Write notes or sayings related to the sacrament. You'll like the idea of marking diamonds for attending Mass and saying Rosaries; pearls for prayers, little crosses for sacrifices, and hearts for acts of love. This really brings these little acts to mind as the child rejoices to see how many prayers and sacrifices are helping him to prepare to receive Jesus well! The idea is to increase your children's desire to love and please God and fortify himself with these devotions. 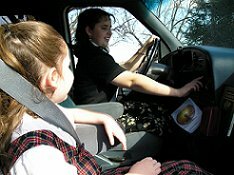 It is encouraging to see the effect on older children, too. First through third grade - Print our cursive worksheets as they are for a larger print or cursive font size. Fourth through eighth grade - Print them two-up to have a smaller size that makes for beautiful handwriting. High school - Print these four-up to have a professional size writing paper. 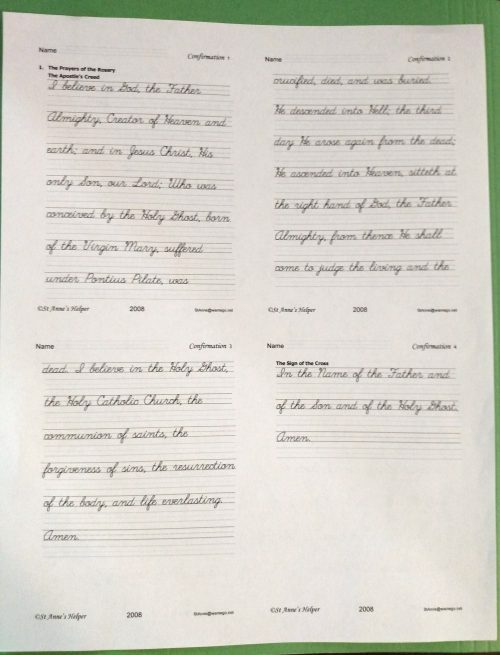 If you know other Catholics who want their children to have cursive writing worksheets, we appreciate your sharing this page with them. Thank you for visiting and for sharing! Homeschool Cursive Writing Worksheets - Printable cursive alphabet worksheets, cursive words, and cursive sentences. 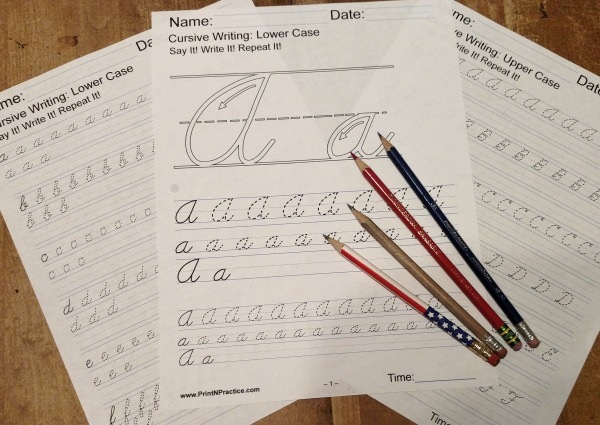 At PrintNPractice.com, our sister site, you will find thousands of homeschool cursive writing worksheets. They teach phonics, spelling, and grammar at the same time as your children practice their handwriting. All the content is derived from old Catholic text books like the Living My Religion series, the DeLaSalle Readers, Harvey's Grammar, or classic nursery rhymes. Especially if you buy the downloads, most of the writing worksheets are in both manuscript print or cursive writing. As with our cursive worksheets, those at PrintNPractice are all interactive. This means that your children can finish them by typing on copies of the worksheets in their own files, or you can print them for them to write their answers. You'll also find thousands of interactive printable worksheets for K-6.